Wendy Myers is founder of MyersDetox.com. She is a detox expert, functional diagnostic nutritionist and NES Bioenergetic Practitioner in Los Angeles, CA. 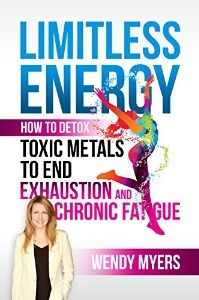 She is the #1 bestselling author of Limitless Energy: How to Detox Toxic Metals to End Exhaustion and Chronic Fatigue and the host of theheavymetaslssummit.com. Wendy currently hosts two podcasts, the Myers Detox Podcast about detox and the Supercharged Podcast about NES Health Bioenergetics. Passionate about the importance of detox to live a long disease free life, she created the revolutionary Myers Detox Protocol and Mitochondria Detox after working with thousands of clients.